The common name "buffalo" has been used to describe North American Bison since Europeans first encountered the species, however, the term "buffalo" is more correctly applied to African and Asian water buffalo. The largest native terrestrial mammal in North America is properly referred to as the American Bison. Bison originated in Asia and spread into North America via the Bering land bridge at least 300,000 years ago. They have survived at least two major glaciations in North America. The primitive form, the Steppe bison, eventually evolved into the Modern American Bison (Bison bison), which is comprised of two races or subspecies - Wood Bison (Bison bison athabascae), adapted to open boreal woodlands, and Plains Bison (Bison bison bison), adapted to grassland habitat. 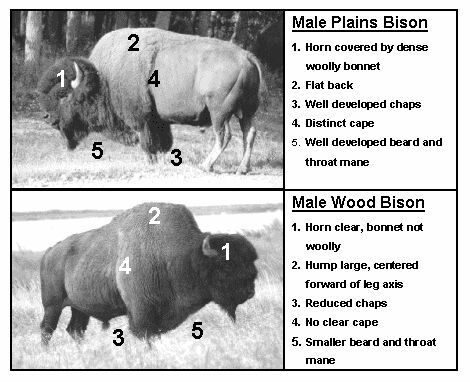 There is considerable academic discussion as to whether or not Wood Bison and Plains Bison are distinctly separate subspecies. In these webpages, the content is primarily directed towards the woodland morph of the American Bison, the Wood Bison. If Wood Bison are not specifically indicated, or if the more general term "Bison" is used, then the information can be considered to refer to both Plains Bison and Wood Bison. Before European colonization in the early 19th century, the Bison's range extended from the Peace River region in northeastern British Columbia, and the Great Slave Lake area in the Northwest Territories all the way to northern Mexico. Wood Bison occupied the western boreal forest regions and Plains Bison occupied the remainder of the habitat. The winter ranges of Wood and Plains Bison may have overlapped, but they probably did not share a common range during the breeding season. Map from: Larter N.C. and D.G. Allaire. 2007. History and Current Status of the Nahanni Wood Bison Population. File report 136. 44 pp. Previously from Gates et al., 2001, adapted from Stephenson et al., 2001. Bison once numbered about 30 million in North America, but with the westward movement of settlers, they were relentlessly slaughtered. There is no way to estimate the historic abundance of Wood Bison in British Columbia. The entire population in Canada is thought to have numbered about 168,000 in the early 1800's. Uncontrolled hunting, particularly after 1860, led to a Canadian population low estimated at 250 by the turn of the century. This population decline also occurred in British Columbia, where the last confirmed Wood Bison from the primordial herd was shot near Ft. St. John in 1906. Although legislation designed to protect Bison was passed in 1877 and 1893, enforcement was ineffective until after the turn of the century, when the Northwest Mounted Police were given responsibility for enforcing the Buffalo Protection Act in 1897 and formal patrols began in 1907. Populations began to recover outside of British Columbia, due to the protection of wild herds and the reintroduction of of Bison into former habitats, but Wood Bison in British Columbia remained extirpated. To preserve Wood Bison habitat, Wood Buffalo National Park was established in 1922, and the total number of Wood Bison in the southern portion of their range was estimated at 1500-2000 individuals. Between 1925 and 1928, over 6,600 Plains Bison were translocated to Wood Buffalo National Park. These Plains Bison hybridized with the smaller Wood Bison population and introduced tuberculosis and brucellosis to the herd. The total Bison population in Wood Buffalo National Park did increase to about 12,000 by 1934, but Wood Bison as a distinct subspecies appeared to be disappearing. In 1959, an isolated northern population of about 200 relatively pure Wood Bison within Wood Buffalo National Park was confirmed. A Wood Bison "salvage" operation to establish disease-free and genetically distinct Wood Bison herds began in the 1960's when individuals were moved to the Mackenzie Bison Sanctuary in the Northwest Territories, and to a fenced enclosure at Elk Island Provincial Park in Alberta. Most of the world population of Wood Bison is derived from the original 37 animals captured and relocated in the early 1960's. During the 1970's, a large number of agencies and organizations formally recognized the plight of the Wood Bison. In 1975, a Canadian recovery program was established with representation from federal, provincial and territorial wildlife agencies and Parks Canada. In 1988, the Committee on the Status of Endangered Wildlife in Canada (COSEWIC) designated Wood Bison as a threatened species. The overall goal of the National-Provincial Wood Bison Recovery Team is the establishment of four healthy, free-roaming herds of 400 or more animals each within the historic Wood Bison range. Reintroduction of Wood Bison has resulted in disease-free herds in the Northwest Territories, Yukon Territory, British Columbia and Alberta. Map from: Harper, W. L., and C.C. Gates. 2000. Recovery of Wood Bison in British Columbia. In: Darling, L.M. (ed). Proceedings of a Conference on the Biology and Management of Habitat and Species at Risk, Kamloops, B.C., 15-19 Feb. 1999, Vol. 2, B.C. Ministry of Environment. p. 915-924. Northwestern Canada contains a significant area of former Wood Bison range. Re-establishing herds of 400 or more genetically pure and disease free Wood Bison would be a major Canadian conservation success story. The Bison is easy to recognize because of its large size, massive forequarters, shoulder hump, large wooly bearded head, short black horns, and moderately long tail with a tassel of dark hair. Long, shaggy chocolate-brown hair covers the head, shoulders and front legs, but the coppery-brown coat on the hindquarters is short. When bulls reach adult size at about 6 years , they can exceed 2 m at the shoulder, and can weigh up to 800 or 900 kg. Adult females average about 320-545 kg and average 1.5 m shoulder height. Both sexes have true horns, although bulls have thicker horns that curve more inwards. Bulls also have a more prominent shoulder hump, and bushier hair on the forehead, chin and neck. Wood Bison are slightly larger and darker than Plains Bison, with relatively shorter neck mane hair and leg chaps, and a more pronounced hump. Bison are gregarious, social animals. Throughout most of the year, they form herds composed primarily of adult females, subadults of both sexes, and calves. Mature bulls usually associate in smaller bachelor groups. Lone bulls are relatively common. Groups of cows and bulls mix during the rutting season, which in northern areas may extend from July to September. Bison have lengthy gestation period of about 9 months. Cows and calves have a close relationship, which declines over time. A single, reddish-brown calf, weighing 15-25 kg, is usually born between mid April and early June. Calves can stand within about 10 minutes of birth, and can nurse within 30 minutes. Calves nurse for at least seven to eight months. The birth coat darkens to brownish black at about two months. Calves grow rapidly and can weigh 135-180 kg by about eight or nine months. In captivity, Wood Bison have been reported to live as long as 30 years, (one report shows 41 years) but in the wild, very few survive more than 20 years. Severe winters with deep snow, and mid winter thaws followed by severe freezing, result in winter caused mortality. Bison are vulnerable to predation by wolves, and in some populations, wolf predation can be a significant limiting factor to herd growth. In other herds, collisions with vehicles can be the limiting factor for successful herd growth. Severe spring storms may cause heavy calf mortality. An accidental cause of death can be drowning, which can often occur when animals fall through thin ice in the spring and fall. Three significant diseases (anthrax, brucellosis, and tuberculosis) can affect wild populations of Bison. Brucellosis and tuberculosis are chronic diseases that reduce productivity and recruitment, cause dehabilitation, and make the animals vulnerable to predation. Anthrax is a highly infectious and often fatal disease. Anthrax spores may lie dormant for many years in the soil, only to cause epidemic outbreaks and significant mortality when environmental conditions are suitable. The animals in the free ranging Wood Bison herds in northwestern Canada are thought to be free of these infectious diseases. Wood Bison are particularly suited to their niche as boreal grazers, and in northwestern Canada, the boreal grazer niche has been largely vacant since their extirpation. In the north, where the snow can last for seven months and reach depths of over 1 m, grazing animals must develop special adaptations in order to survive successfully. The Bison's unusual body shape, where the slim hindquarters appear out of proportion to the massive build and and heavy coat of the forequarters, is one adaptation to their need to forage through snow, a constant feature of their environment in winter. Bison have spines on their upper vertebrae that can be up to 50 cm long in adult bulls. These spines support the large muscles that Bison use to employ the unique head-swinging action to clear away snow from their food. Although Bison feed almost entirely on grasses and sedges that are easily covered by snow, they can exist in ares where snow cover is too deep for most other ungulates. Bison change locations in response to seasonal changes in weather and food sources. Historically, wild herds of Plains Bison migrated long distances. In boreal forests, Wood Bison tend to have seasonal migrations of relatively short distances (< 20 km), but wandering mature bulls may travel 100 km or more. Wood Bison return to the same winter calving and breeding sites each year. Wood Bison can be considered a keystone species in boreal forest ecosystems where suitable habitat conditions exist. They are capable of exploiting a unique niche of coarse grass and sedge meadows, including industrially disturbed sites such as roadsides. In spring and early summer, Wood Bison utilize willow savanna and large open-prairies for calving and post-calving activities. During late summer and fall, they disperse into small groups for the rut, using forest stands for traveling between meadows, and they use wooded areas for summer shade and also for shelter in winter storms. However, they do little foraging in the forest. They often choose sandy ridges for wallowing. Wolves are the most effective predators of northern Wood Bison, but both black and grizzly bears as well as wolves may prey on Bison calves. Photos from: Carbyn, L.N., Oosenbrug, S.M., and Anions, D.W. 1993. Wolves, bison and the dynamics related to the Peace-Athabaska Delta in Canada's Wood Buffalo National Park. Circumpolar Research Series No. 4. Edmonton: Canadian Circumpolar Institute, University of Alberta. Within the historic range of Wood Bison, there is little dietary overlap between Wood Bison and other large ungulates. There is some potential for minor components of Wood Bison diet to result in competition with other species for forage, providing that both species occur in the same area and the forage item is limiting. Fall use of terrestrial lichens may overlap the forage needs of caribou, and spring browsing of willow may overlap the forage needs of moose. Wood Bison herds may indirectly influence predation rates on moose by supporting higher wolf densities than would exist without the presence of Wood Bison. Bison Control Areas in NWT and Wood Buffalo National Park. Bison Control Areas zones highlighted by dark gray borders. Bison herds considered to be diseased indicated by cross hatching. HL= Hook Lake; LBR = Little Buffalo River; NY = Nyarling; HC = Hay Camp; GR = Garden River; DL = Delta; FB = Firebag; WZ = Wentzel; WA = Wabasca; BM= Birch Mountains. Bison herds considered to be disease free are indicated by single line hatching. 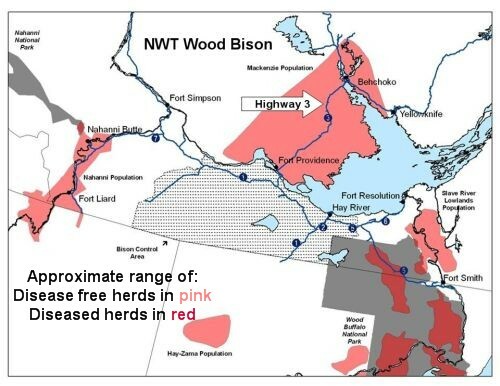 MB = Mackenzie; NH = Nahanni; PM= Pink Mountain; HZ = Hay-Zama; Liard Reintroduction (Nordquist herd); Etthithun herd. Map from: Nishi, J.S. 2002. Surveillance Activities under the Northwest Territories Bison Control Area Program (1987-2000). Manuscript Report No. 145. The information below was presented at the Bison and Roads Committee meeting in December 2006, at Fort Nelson, BC, by John Nishi, Northwest Territories, Department of Environment and Natural Resources, with information provided by Nic Larter, Dehcho Regional Biologist, Department of Environment & Natural Resources, Ft. Simpson, Northwest Territories. 1963 - 18 animals transferred from Wood Buffalo National Park to the Mackenzie Bison Sanctuary, north of Great Slave Lake. Two animals died soon thereafter, and the remainng 16 animals became the foundation of the current herd. Local flooding in the herd's former core range may be a contributing factor to its range expansion and increased numbers of animals on Highway 3. Error bars are 95 percent Confidence Limits. Between June and September, there are reports of nuisance Wood Bison grazing in gardens, yards or on community airstrips in Fort Liard. Wallowing in unfenced sandy or dusty areas is also an issue. March 2011 - Population estimated at ~413; bison were more widely distributed and observed over a larger area than had previously been observed. Some collared animals have moved to the west, up and down the Kotaneelee Valley. Collared and non-collared animals followed the Liard Highway corridor and used areas much further north than in past summers. Animals were observed as far north as Poplar River (km 220), and in the past they had rarely been seen north of Blackston (km 155). Wood Bison release locations are indicated by small bison icons. From: Larter, N.C., Allaire, D.G., and T.S. Jung. 2007. 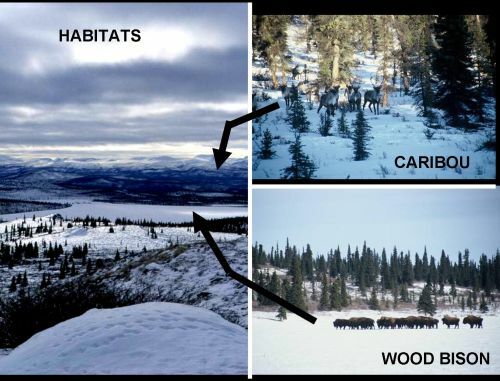 Population Survey of the Nahanni Wood Bison Population. March 2004. Manuscript Report No. 176. Nordquist Range from Rowe, 2007. 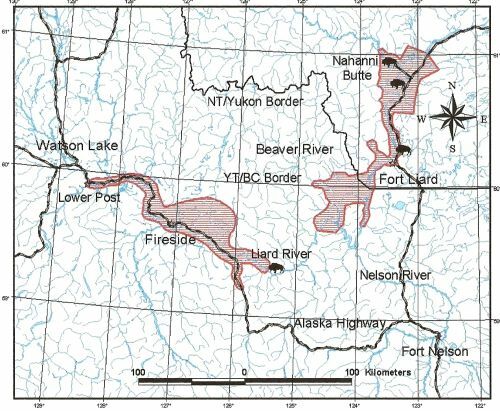 The Northwest Territories biologists are concerned with the potential for infection of the reintroduced Mackenzie and Nahanni herds from the diseased Wood Buffalo National Park population in Alberta. A Wood Bison Management Strategy for the NWT was released in January 2009. Contribute to the recovery of free-ranging, healthy wood bison throughout their historic range in Canada. The information below was presented at the Bison and Roads Committee meeting in December 2006, at Fort Nelson, BC, by Tom Jung, Senior Biologist, and Philip Merchant and Todd Powell, Yukon Territory, Department of Environment. 1998 - Yukon Wood Bison Management Team (YBMT) was formed, as recommended by the 1998 Management Plan. Can a reintroduction be too successful? One of the main issues addressed by the 1998 Management Plan was the rapidly increasing size of the Aishihik herd. For this herd, the carrying capacity (number of individual animals that can be supported) was not defined by the ecological resources of their range, but rather by the "social carrying capacity", or tolerance, of local peoples to the presence of Wood Bison on the land. Wood Bison had moved into areas where they were not welcome and caused damage that did not help in garnering support for their establishment and conservation. Local First Nations supported the recovery team objective of maintaining a minimum viable population of Wood Bison in their traditional territories. However, there was not a lot of local support for allowing the herd to continue to grow and expand into new areas. How do you manage a nationally threatened, but locally abundant, species? No predation or other controls on herd growth, coupled with community concerns about the impacts of this herd growth, led to the decision to establish a sport and subsistence harvest, carried out largely by Yukoners and the two First Nations, as the only means to limit herd size. Hunting was implemented following community consultations (arising from the 1998 plan) as a means to keep the population within socially accepted limits. This was not an easy decision, given the national status of Wood Bison as a threatened species, but options were limited and community concerns about the impacts needed to be addressed. Harvest has been largely well received in the Yukon. Provides a cultural reconnection between local communities and a species that have not shared the land for many years. As this graph shows, harvest appears to be successful, thus far, in keeping the herd below 500 animals post-harvest, but above the national recovery goal of 400 animals. Wood Bison are slowly weaving their way back into the cultural fabric of Yukoners. Many Yukon hunters that have learnt about and hunted Wood Bison have a new respect and value for the species. This is the most important long-term conservation gain of the hunt – and one that, ultimately, will likely create the public will to always maintain Wood Bison on the land. In the 2006-07 season, 87 Wood Bison were harvested. Revised bison hunting regulations were introduced in September 2008 in order to implement a new adaptive management framework. This adaptive management, which will be carried out on a 5 year trial basis, will give the Minister of Environment increased flexibility to make decisions regarding season dates, permit numbers, and to open subzones for hunting bison. There will be an initial annual allowable harvest of 200 bison between December 1, 2008 and February 28, 2008. Hoping for a managed hunt in 2007/08 to control numbers. News Release - The Fish and Wildlife Division of Alberta Sustainable Resource Development (ASRD), with endorsement of the National Wood Bison Recovery Team, is implementing a hunting season as an interim strategy to manage the Hay-Zama wood bison herd. Biological samples from all harvested Wood Bison will be requested from all hunters, and used for disease testing. The interim strategy to manage the Hay-Zama Wood Bison herd will be closely monitored. Future management plans will be based on the results from this interim strategy. The information below was presented at the Bison and Roads Committee meeting in December 2006, at Fort Nelson, BC, by Mike Rowe, Biologist, and Dean Maclean, Senior Park Ranger, British Columbia Ministry of Environment, with input from Colin Leake, Public Works and Government Services Canada, and Roy Rea, University of Northern British Columbia. 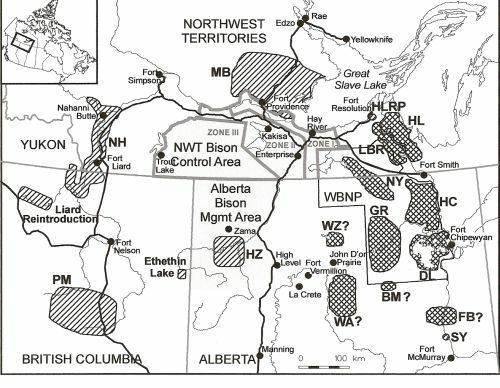 The information collected by the Minstry of Environment on Wood Bison shows that all three BC herds are transboundary herds whose ranges overlap with either the Yukon (Nordquist herd), Northwest Territories (Nahanni herd), or Alberta (Etthithun herd). It is not clear whether the Hay-Zama herd from Alberta also range in BC. There is currently no licensed hunting of wood bison in BC. 5 GPS collars deployed on female bison in March 2009. The collars were fitted with reflective plating to make them more visible to motorists at night to increase human safety and reduce bison mortality. Many of the GPS collars deployed in March 2009 became inverted with the antenna pointing towards the ground. There is concern that this may reduce the life of the collars and result in fewer location fixes than expected. Road-based classified counts were conducted between June 2009 and March 2010. Salt blocks were placed in 2 different sites to encourage bison to remain away from the highway and in their calving areas near Nordquist Lake . A series of prescribed burns within the Nordquist bison herd’s range were carried out and created ~1000 ha of early seral habitat, hopefully encouraging bison to spend more time away from the highway. A large wildfire occurred near the Smith River, which burned 13,448 hectares within the Nordquist herd’s range during the summer of 2009. Summer 1997 - the herd followed a road allowance 100 km south and joined an escaped feral herd of commercial bison. The mixed herd was captured, quarantined, disease tested and subsequently sold into private ownership. The concern was the loss of genetic distinctiveness of the Wood Bison subspecies. Funding from the sale was allocated to Wood Bison management in northeastern British Columbia. 1999-01 - In the second reintroduction attempt, 40 bison from Elk Island Provincial Park were released into an 850 ha paddock. The expected release was to be in 2004 or 2005, thereby ensuring they were imprinted on the release site, preventing southward travel to agriculturally developed areas. 5 GPS collars deployed on female bison in March 2009. The collars were fitted with reflective plating to make them more visible to motorists at night to increase human safety and reduce bison mortality. Many of the GPS collars deployed in March 2009 became inverted with the antenna pointing towards the ground. There is concern that this may reduce the life of the collars and result in fewer locations than expected. Doig River First Nation was provided with a permit to hunt and kill up to 12 wood bison within the Etthithun herd’s range during 2009/10. The permit specified the area in which harvest could occur and was focussed on the southern portion of the herd range. The permit objective was to utilize harvest to modify the movement patterns of the herd to discourage them from using the southern portion of their range where they come into contact with agriculture. It was also hoped that hunting would make the animals more wary of humans to address issues of personal safety near the bison. Pyric herbivory is defined as the ecological interactions between fire and grazing which result in shifting spatial patterns across the landscape. It is well documented that bison have a historical interaction with fire, meaning that their grazing patterns and movement across the landscape are greatly influenced by fire. Following Wildfire 084 (located at Smith River, BC; with 13,448 ha burned within the Nordquist herd range), a Ph. D. research project was initiated to observe differences between grazed and ungrazed plant communities in burned environments. Randomly located exclosures that exclude large mammalian herbivores were constructed throughout the wildfire, in areas with similar fire severity and pre-burn stand composition. Vegetation composition and abundance will be compared between grazed (treated) and ungrazed (control) areas using analysis of variance, ordination, and multivariate techniques. Potential exists for competition between the free roaming Plains Bison Pink Mountain herd and Wood Bison if the ranges should overlap. The presence of this free roaming, feral Plains Bison herd jeopardizes the Wood Bison herd at Etthithun Lake and can potentially comprise Wood Bison recovery efforts in Alberta, the Northwest Territories, and the Yukon.